One of the great advantages of tilapia for aquaculture and aquaponics is that they feed on a low trophic level. The members of the genus Oreochromis are all omnivores, feeding on algae, aquatic plants, small invertebrates, detrital material and the associated bacterial films. The individual species may have preferences between these materials and are more or less efficient depending on species and life stages in grazing on these foods. They are all somewhat opportunistic and will utilize any and all of these feeds when they are available. This provides an advantage to farmers because the fish can be reared in extensive situations that depend upon the natural productivity of a water body or in intensive systems that can be operated with lower cost feeds. In extensive aquaponics, the fish will be able to grow by eating algae and detrital matter and the farmer can grow more fish in a given area because the fish are depending directly on the primary productivity of the body of water, primary consumers. Fish which feed on a higher trophic level, eating larger invertebrates or small fish, are secondary consumers and a system can only support a fraction of the biomass of secondary consumers compared to primary consumers. In intensive aquaponics systems, tilapia has the advantage that they can be fed a prepared feed that includes a high percentage of plant proteins. Carnivorous fish require fish meal or other animal proteins in their diets, which in general are more expensive than plant proteins. Nutritional studies which substitute plant proteins supplemented with specific amino acid supplements may lower costs, but still not to the level that can be achieved with tilapia diets. Complete diets are used in systems that cannot provide any dependable nutrition. This would include intensive recirculating systems; cages placed in water with low productivity and even heavily stocked ponds that do not provide enough nutrition for all the fish in the system. Supplemental diets will provide only portions of the nutritional demands of the fish, with the assumption that they will get most of the nutrients from the growing system. 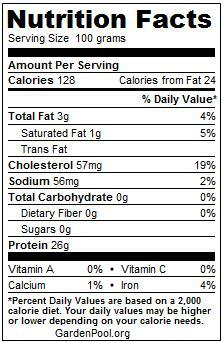 Supplemental diets are usually much less expensive than complete diets and usually high in carbohydrates. Some simple supplemental diets serve a dual purpose of fertilizing the pond as well increasing productivity. Considerable research has been conducted on complete diets and on fertilization programs for natural and man-made water bodies. Development of supplemental diets directed to specifically provide limiting nutrients is a growing area of research. Feed manufacturers will adjust the mix of ingredients to create what are called “Least Cost Feed Formulations”. These are formulations that use spreadsheet and database programs to examine the nutritional characteristics of many ingredients at the same time. The program can then select the mix of ingredients that meet all the nutritional requirements at the lowest manufacturing cost. These feeds will then meet the “Guaranteed Analysis” on the manufactures label, which tells any purchaser of the feed what they can expect from the feed. As you can see, tilapia will provide you with plenty of protein without adding many calories to your diet and it contains no carbohydrates. 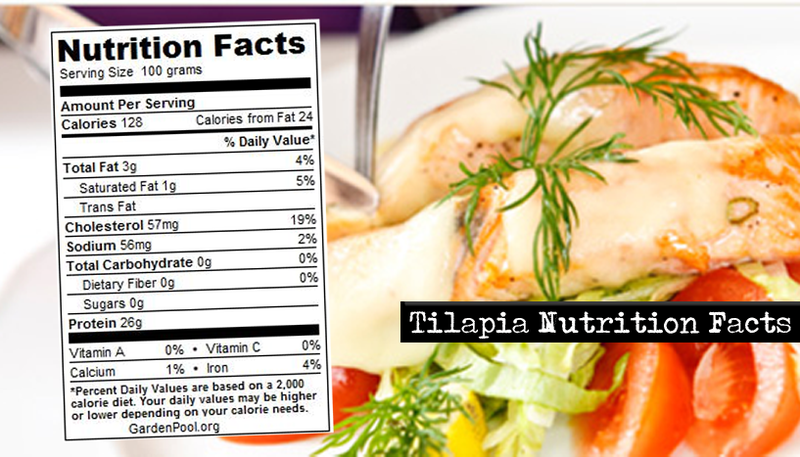 Tilapia is an excellent source of phosphorus, niacin, selenium and vitamin B12, and a good source of potassium. They way we handle of our food have a huge impact on its final nutritional value. By following the tips below you can prevent important nutrients from escaping from your tilapia. If you purchase whole, fresh tilapia, chose specimens that smells fresh with clear eyes and clean gills. Tilapia that smells musky should be avoided. The fish should also have moist, shiny and tightly adhering scales.If you buy fresh tilapia fillets, only purchase fillets with a fresh smell. Avoid musky fillets.If you buy frozen tilapia, carefully check the fish when thawed and discard it if it feels mushy or smells strange.Store your fish in the refrigerator. If you need to travel far from your store to your home, place the fish in a cooling bag.Frozen tilapia with a tight wrap can be stored up to four months in the freezer (0°F / -18°C). It is very important not to allow the tilapia to thaw on its way from the grocery store to your kitchen.Fresh tilapia can be stored for two days in a really cool refrigerator (32 to 38°F / 0 to 3°C). The same is true for thawed tilapia.Frozen tilapia should be thawed in the refrigerator, not in room temperature. Do not refreeze thawed tilapia.